Reading the rich mathematics in this text makes me wish I could go back to a time with less media noise. 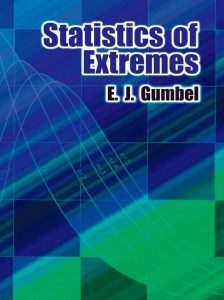 The author, Emil Julius Gumbel, explored asymptotic distribution, which he discusses in the book as “incidences”. Three conditions (the smallest value, the median, and the largest value) and their order statistics give rise to six limiting distributions of exceedances (Table 2.2.7). Many software packages will fit curves to the General Extreme Value (GEV) distribution. The GEV distribution tools are the fruits of EJ Gumbel’s hard mathematical work here in this book. Using modern software tools (even in Excel) you can tinker with the GEV distribution. But to apply the GEV intelligently, you’ll need this wonderful statistics book.